It just means a massage that is perfectly attuned to the WHOLE of you. When you come for a massage with me at Meadowspace you don’t just receive a massage routine I learned years ago in college and have been churning out ever since. 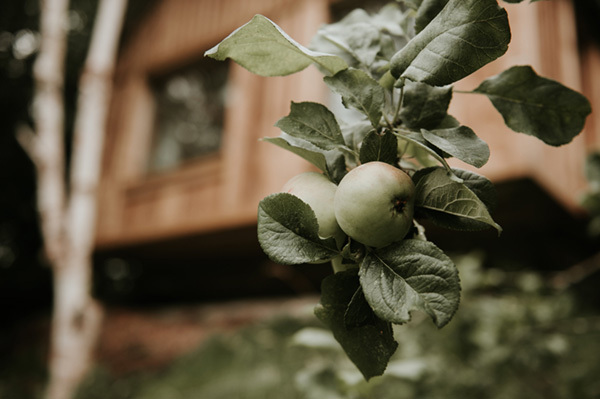 You receive a treatment that has been carefully tailored to address your physical symptoms (aching muscles, stiff shoulders, difficulty sleeping) as well as your mental and emotional ones (anxiety, stress, difficulty switching off) to create a treatment that is as individual as your mood. Holistic massage therapists master a wide range of massage techniques from subtle energy work to deep tissue methods; from dynamic mobilisations to gentle holds. I use flexibility, creativity and judgement in applying this knowledge, selecting only those techniques that will do nothing less than meet the needs of your mind, body and soul, every time you come for a treatment. I believe we are ALL perfect just as we are. Whether our bodies are tall or small, rounded or slender, slight or muscled; each body is exactly where it needs to be right now so let’s start treating our bodies with the respect and love they deserve. Massage allows us an opportunity to experience the full physical magnificence of our selves without thinking about what we look like to others and can be a useful resource for people who have a complex relationship with their body. 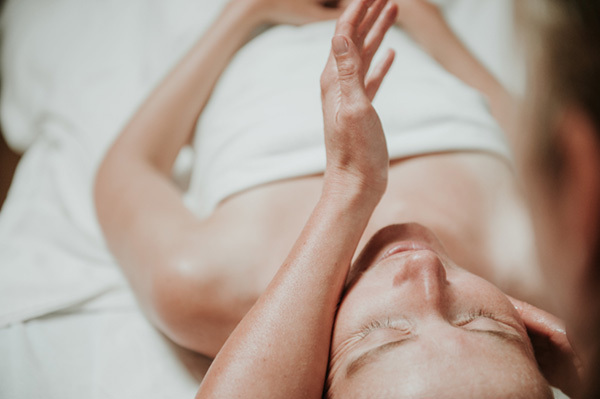 Through massage we learn about interconnectedness – how the way we use our fingers affects the way our shoulders feel, how the position of our feet affects our hips and lower back. We learn where we hold our emotional tension and techniques for releasing that tension that allows life to flow more smoothly and easily. Massage allows us to enter into a deeper understanding of who and what we are and offers a short window of time to experience a profound peace that you can take back with you into day to day life. Stress. We talk about it so often we barely take it seriously. But we should because spending too much time in the state known as ‘Fight or Flight’ is killing us. You will be amazed at how easily the body starts to heal itself once it lets go of its stress so don’t be fooled into thinking only deep tissue work can relieve muscular pain! 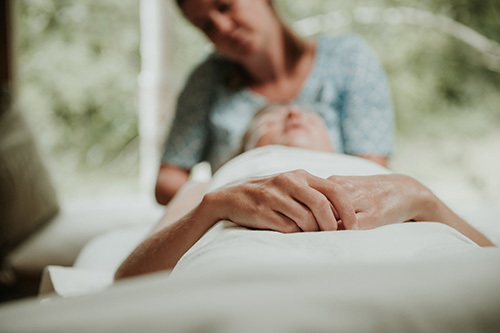 A one-off massage is always a lovely relaxing treat but if you are going through a big life change, regular massage can act as an important support offering physical and emotional sustenance for difficult times. If you would like to discuss what this might look like, please do contact me for a confidential discussion. Why do our muscles hurt after exercise? As we work out we use up our energy stores (fat!) and in doing so produce a by-product called lactic acid. This builds up in the muscles and irritates our nerve endings contributing to that feeling of stiffness and soreness. A good post exercise massage will knead and squeeze the muscles to relieve stiffness, spasm and tightness. We will be hoping to improve fluid circulation so that wastes such as lactic acid are removed and oxygen and nutrients delivered more effectively. 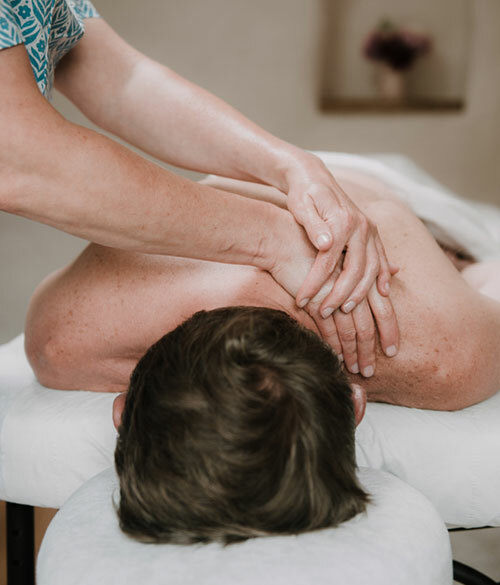 We might consider some light massage to interrupt the pain cycle if you are suffering from muscle spasm and bring in some percussive strokes to cause minute contractions in the muscle fibres which can improve muscle tone. Focussed work for sore muscles can be incorporated into a 90 minute full body massage or we can use a 60 minute treatment to focus on specific areas. Muscle tension is why we have those mysteriously hard painful muscles that have nothing to do with exercise. It starts when we tense up for a physical task or in response to stress but don’t relax completely afterwards. Over time it becomes an unconscious part of us. When muscles are constantly tight, they are working and consuming energy to no good effect. We become tired more easily and our range of movement is restricted. 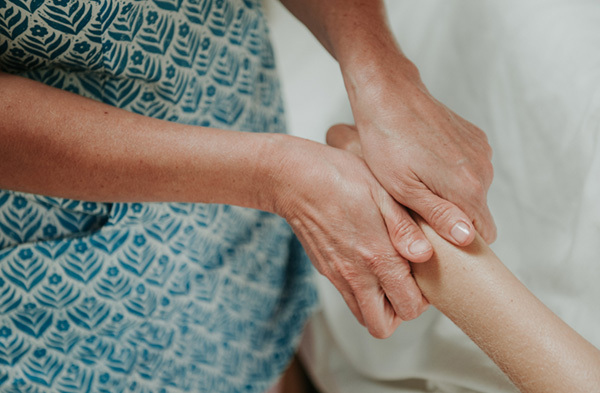 Massage can help to release some of this tension by gently encouraging muscles to ‘let go’, often through reassuring holds and the long gentle strokes known as ‘effleurage’. Deep tissue work can help release the ‘wrapping’ around the muscle, allowing the muscle to soften and release while passive movements such as shaking, rocking and joint mobilisation may have an effect on resting muscle tone and decrease joint and muscle tension. This work can be incorporated into a 90 minute full body massage or we can use a 60 minute treatment to focus on specific areas. Pregnancy is a miraculous time in a woman’s life, but it can also be overwhelming and daunting, both physically and mentally. During this time, massage can provide physical comfort and relief, relaxation & reassurance. During pregnancy the mind-body connection grows deeper affecting both you and your baby. At each appointment we invest time in thinking about what’s going on for you and how your mind, body, soul and environment are changing. We then create a treatment that is perfect for you in that moment. Because massage can be so beneficial throughout pregnancy I offer a special Pregnancy Package that allows you to have a massage every month, checking in with your body and allowing you to fully experience and own this precious time. Being diagnosed with a long-term health condition can be frightening and disorienting. Once you move beyond the initial shock of your diagnosis, there is the job of learning how to cope with the daily stresses of living with your illness. Massage can provide a safe space where you don’t need to put a brave face on and where we can work together regularly, responding to whatever new demands your condition throws up at that particular point. We may be working to achieve a particular outcome or simply to give you time out to reflect and relax and perhaps to allow your body to feel wonderful for a while. I am happy to work with your care team and consultant to discuss treatments and offer home visits, discounted rates and the option of last minute cancellations (if you are too tired or in pain) for regular clients.